If you ever want to consider drawing your own texture for the game then this information here will be quite useful! Download can be found at the end of this post. These are triangles within a 32 x 31 sized rectangle. The two triangle textures overlap each other. This gives some additional challenge for drawing a seamless texture, because repeating parts will be also within the triangle and not just in the outer edges. Also normal textures have their minimap color ripped directly from the texture from position 16 x 0. Water and lava textures are quite simple in that they are two triangles stacked on top of each other. Each triangle fits within a 53 x 27 rectangle. A more challenging thing to understand is that the textures are rendered 135 degrees clockwise (so that the “water” text in the debug texture above appears horizontally in the game). Regular roads, gravel / donkey roads, waterways and mountain roads consist of two parts: the main road part and a node part that is drawn to the ends of a road. The odd part about these graphics is that they are inverted vertically. In addition to this the node part is rotated 90 degrees clockwise after being inverted so that the dashed line will points upwards. Another thing to note about roads is that they are drawn at roughly half the resolution. Each pixel does get used at some point though depending on slopes, height etc. These triangles are drawn to the edges seamlessly so that if you have a lone triangle texture the visual end result would be a hegaxon if the edges would be of a fully solid color. Also note that all the debug textures use the same color that is in the edges. These were once part of the game but were removed before release, however they do remain usable. They are drawn exactly as you can see them, which makes them somewhat more convenient. The sad part about these textures is that their edge is desert so when they are against each other a desert edge is drawn. 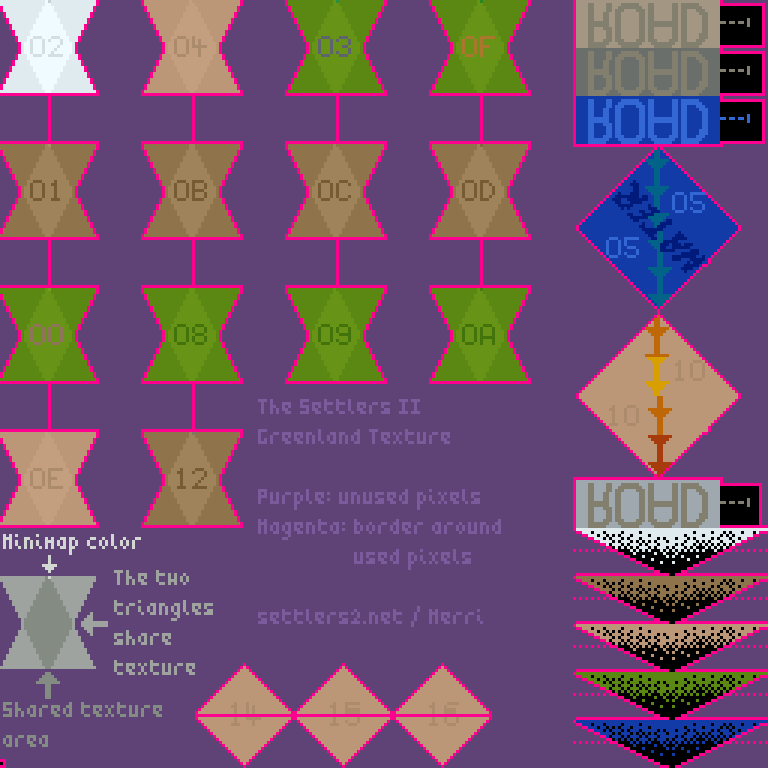 As these triangles are quite small they appear quite low resolution in the game, which is also a bit nasty. There is a lone pixel at the bottom left corner in position 0 x 254. This will result in a solid single color texture with no shading and no edges. Magenta pixels around the textures are never drawn. If you use this debug texture and see magenta somewhere then please report it to me so I can adjust and fix the debug texture file! I drew a dotted line near each road texture. I think this is the point where going much further makes the edge look a bit “off”. At least if you attempt to make a smooth transition. You can see a single pixel extending off water and lava textures. It is actually a lone pixel that can get drawn outside of the triangle area probably due to a small calculation error within the game. Remember to backup the original TEX5.LBM! I just wanted to know which parts of textures are actually drawn by the game. So it uses two simple triangles and both triangles use the same texture. On flat surface the triangle is within roughly a 31 x 30 rectangle, but it can stretch by one additional pixel to both directions to 32 x 31 when drawing slopes. Everything else is quite different. Dot Age is turn based and does not have a competing player. Your enemy is the nature: diseases and events will throw the challenge at you. Also, it is a bit funny when you game over to mass diarrhea. The game has been greenlighted on Steam a month ago and the dev is aiming for end of the year release. Nick Beer has made a nice command line tool for creating your own missions, including simple victory conditions and story. There are still many missing features and it isn’t particularly user friendly as it is now, as you can’t just run it and magic happens, but it is the first tool available in years for making missions that is also free to use! If I recall correctly all the previous tools have been payware and only available in German language. Go ahead and download S2 Map2Mission and read how to set it up and use it! As a side note: our online Map Generator does not currently support harbor generation. Adding the support is possible, but I’d rather make it “properly” instead of just quickly hacking it in. Doing it well makes it impossible for you to generate harbor maps that aren’t truly playable. DOSBox emulation soon viable in a browser! Internet Archive has published quite a few MS-DOS games on their website, ready to be played! Some of the notable titles include Jazz the Jackrabbit, Commander Keen 5, Tyrian and Stunts. Yup, there is no Settlers II, at least not yet. 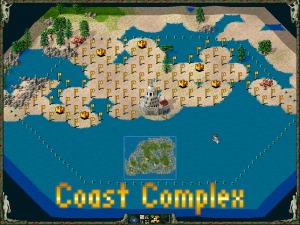 However since things are looking quite good there is a possibility for the future: it may be possible to generate maps and run an immediate trial of it on demo version of The Settlers II right here on this site! I hope things advance nicely during this year so that DOSBox running in a browser no longer lags too much and won’t cut music as much as it does now. Mouse may also be a bit of an issue right now, at least it didn’t follow my actions properly when I tried to play Triplane Turmoil. Anyway, great new possibilities are clearly going to happen this year, or soon enough! This is an experimental map from Map Generator. 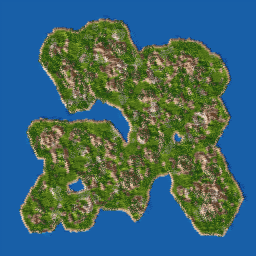 Map size is 176 x 144 and it is for 6 players. Mountain minerals are rarish to obtain. Is this kind of map worthwhile to play? Should I share a map every now and then? I’d like to hear from you! There have been some nice changes during the past week, although not many of them as visible as some people might like them to be. Development has branched to a new GitHub version. Old version has been made available as well. 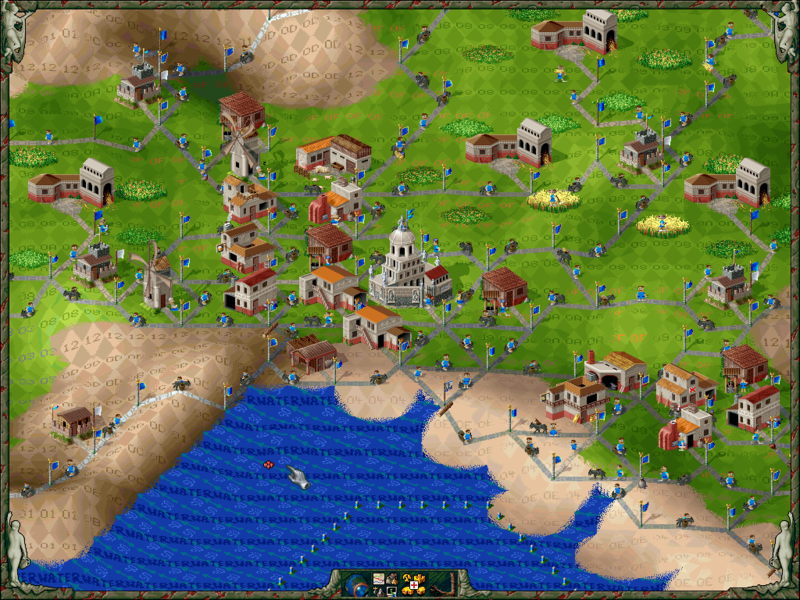 Maps are now perfectly compatible with The Settlers II. Some very nice speed optimizations that make generating a map 100% faster than it was. Also some bugs have been fixed while doing the optimizations. Height map generation has been improved, better looking mountains (less “rings”). There is more variety in landscape: coasts and swamps have been implemented, and there is mountain meadow around mountains. Bring more customization options back! 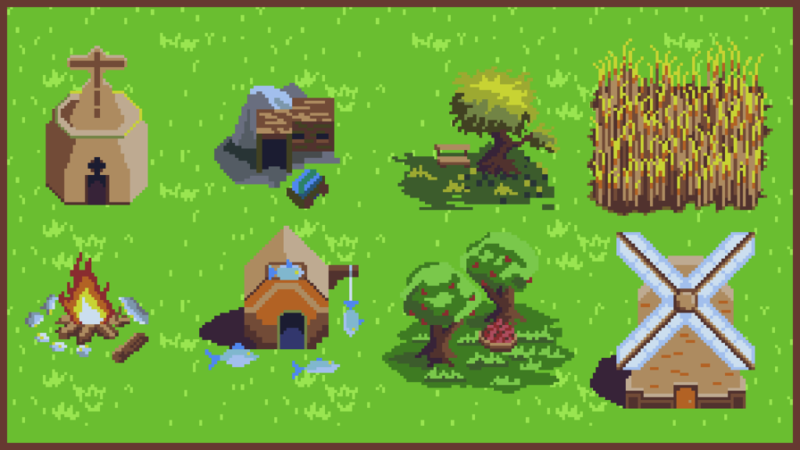 Provide different kind of presets to make it easier to generate maps to one’s liking. Visit the Map Generator! Or try the older one if you want to play around with more options. Just to display some of the invisible progress of the past days: more texturing features on Greenland maps.